Published by Pauline Pontois 6 July, 2018 in Trade and industry group. Following a successful project in 2017, the art & theatre association Meeting Plays is back with a new summer theatre in Biskopsgården. Together with professional stage performers and youth leaders, young people from Biskopsgården and Torslanda produce and perform a unique show. “Hej Blå” street theatre has now performed in a variety of locations in Biskopsgården. The Trade & Industry Group at Göteborg & Co, which supported the project, attended one of the performances. 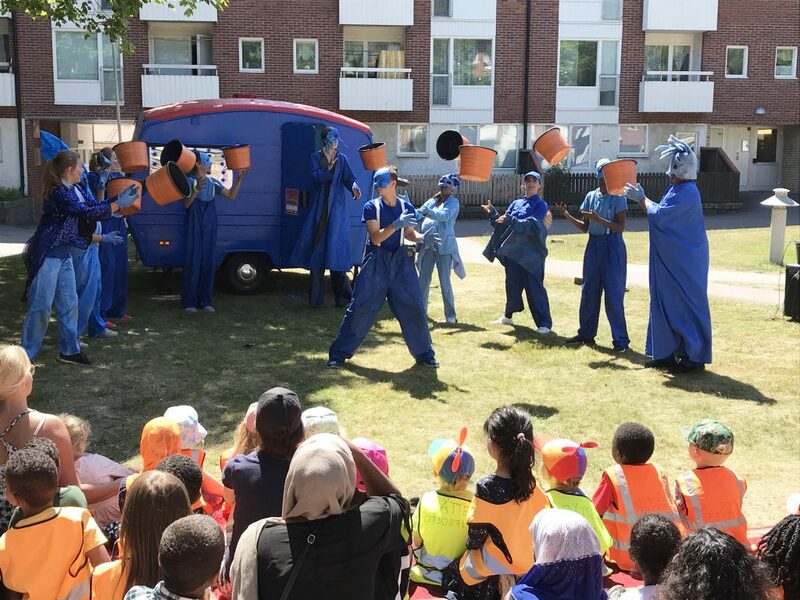 On a warm, sunny afternoon around 80 children from nearby pre-schools and housing estates gathered in the area where the mobile arts centre, a blue caravan, had parked up for the day. They had come to watch a performance of the new theatre adventure “Hej Blå”, produced by 15-year-olds from Biskopsgården as part of a summer project. The young performers, who had recently finished their last year at school, had been working for six hours a day, alongside professional stage performers to write, rehearse, and perform the show during a tour of Norra Hisingen. “Last year the youngsters performed in front of an audience of the same age, but this year they wanted to do something different. We changed it so that the group performs a show aimed at younger children from pre-schools and nearby housing estates. This makes it much more fun for them and they learn different forms of street theatre, in which you never know how the audience will react!” say Åsa Janson and Anna Leyman, both project leaders for Meeting Plays. After a greeting by the “Raspberry Princess” we see movement in the caravan. A group of strange characters all dressed in blue, with masks and painted faces, emerges from the little caravan. These are the aliens. Their spaceship has crashed on Earth and the group is trying to communicate with us as best they can. Thanks to a combination of tricks, dance and music the aliens succeed in communicating with the clearly impressed children in the audience, who welcome the blue group with big smiles. In an adventure lasting 30 minutes, during which hardly a word is spoken, the children learn to welcome those who look different – people who may look weird at first but turn out to be really nice and interesting when you make an effort to communicate with each other. The project collaborated even with another summer holiday initiative called Bonnier Hoops, which is also aimed at children in Norra Biskopsgården, where the theatre group had the opportunity to present their project and play live music.